Sick of cliches about diet food? The ‘gals’ from Adland are sure to put a smile on your face! We don’t eat a lot of processed cheese in the Bangers & Mash household, but I am trying to keep an eye on my weight so when Kerry invited me to try out their LowLow cheese spreads I was keen to give them a go. This spoof ad made me chuckle and I love the idea of cutting down on our fat intake without sacrificing on taste. Can it really be possible? 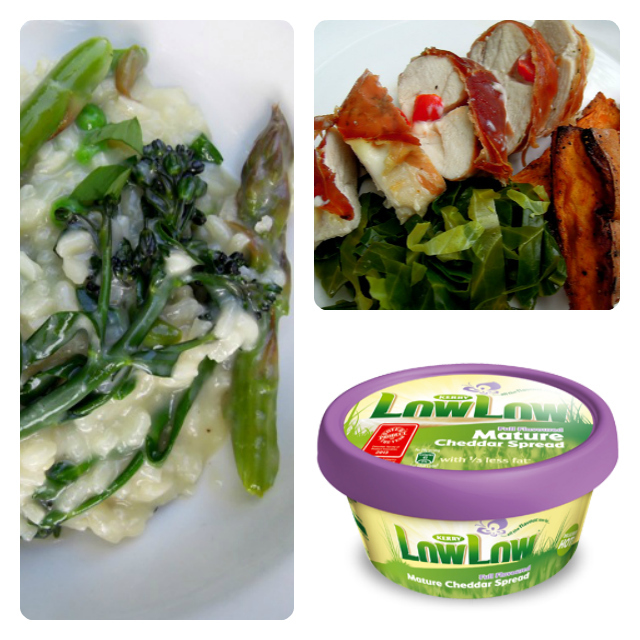 While LowLow probably won’t replace a couple of slices of a mature local Cheddar in my lunchtime sandwich, I was impressed with LowLow as a cooking ingredient and will use it again as a substitute for full fat soft cheese or maybe even cream in certain dishes. Kerry sent me recipes for Pancetta Wrapped Chicken and Spring Vegetable Risotto and I put them to the test on my family, including my discerning mother who was over from Spain to stay this weekend. I played with the recipes a little to suit the tastes of my brood and also to make the most of what happened to be in our fridge, particularly the heaps of wild garlic and purple sprouting broccoli we have to use up. Scrub the sweet potatoes, dry with kitchen towel and slice into wedges. Place in an ovenproof dish, spray with a little low-fat oil and sprinkle with Cajun seasoning. Roast in the oven for around half an hour until soft inside and a little charred on the outside. Meanwhile, prepare the chicken breasts by cutting a slice in each one at the thickest point, to create a pocket. Spread a quarter of the LowLow Mature Cheddar Spread into the pocket and pop a couple of sun-dried tomatoes into each one. Wrap 2 slices of pancetta around each chicken breast, making sure to seal the pocket. Place the chicken breasts on a baking tray and spray with low-fat spray. Season with black pepper. Cook for 20 minutes. While the chicken is cooking, shred the greens and steam for 4-5 minutes. 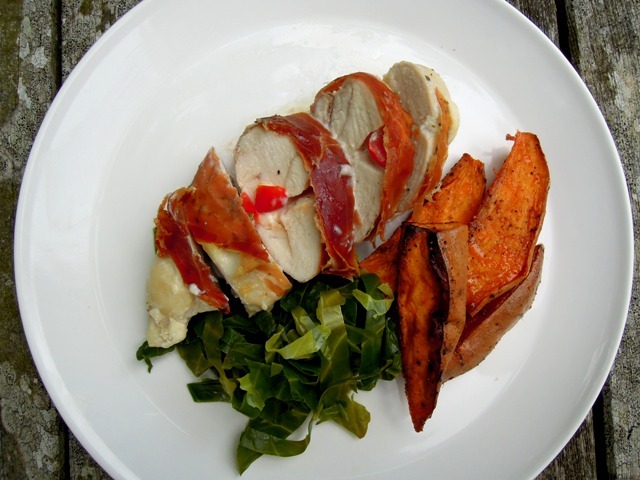 When the chicken is cooked through, slice and serve with the greens and sweet potatoes. Enjoy! Heat the oil in a large, heavy-based saucepan. Add the shallots and sauté for 3-5 minutes until they are soft. Stir in the rice so it is coated with oil. Pour in a ladleful of stock and stir. Cook, stirring regularly until the stock is absorbed. Continue until the stock is used up and the rice is tender all the way through. In the meantime, steam the asparagus and broccoli until just cooked, retaining a little bite. 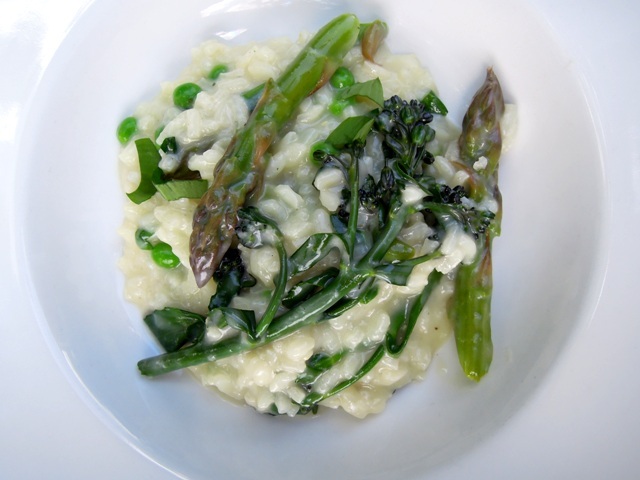 When the rice is cooked, stir in the asparagus, purple sprouting broccoli, LowLow Mature Cheddar Spread and wild garlic. Cook for a minute or two until the vegetables are heated through and the cheese has melted. Serve immediately, sprinkled with a little extra wild garlic. If you’d like to try Kerry’s LowLow yourself, I have five vouchers each worth £3 to give away. Simply leave a comment below saying why you’d like to try it. Looks delectable! Although I have never hear of LowLow over here in Seattle Washington I am sure we have sometime a bit similar. I would probably never choose to use a lowfat version of any cheese when making risotto, HOWEVER, a bit eye opening as you say it was every bit as good and creamy. I could use the cut down on the calories too! I should try my next risotto as a lowfat version. I have always been a food purist, however I have had to alter my thinking with my 3.5 stone weight loss and now maintenance by counting calories. I am always on the look out for a low cal option to my cheese cravings. I will be getting this for a try A.S.A.P. Would love a voucher!